WP-17FV 12ft 150A, Air-Cooled TIG Welding Torch Gas Valve & Flex Head Package. Premium quality 150 Amp air-cooled Weldcraft style(REPLACEMENT) WP-17FV flexible head with gas valve TIG complete torch with 12-foot original rubber double-deck power cable (1-Piece style). Can accept higher air pressure. Use standard Weldcraft TIG consumables and parts. This complete TIG torch package includes. WP-17FV flexible and gas valve head body with handle (2). 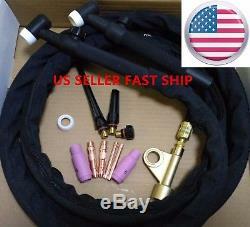 57Y03R 12 -foot rubber power cable hose (1). 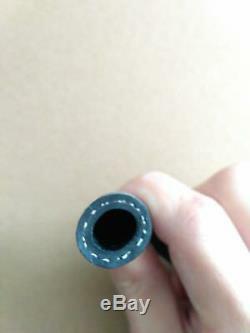 10 -foot long jean cable cover with zipper (1). 105Z57 copper power cable adapter (1). 57Y02 long back cap (1). 57Y03 Medium back cap(1). 57Y04 short back cap (1). 10N48 #6 ceramic cup (1). 10N49 #5 ceramic cup (1). 10N31 1/16 collet body (1). 10N32 3/32 collet body (1). The item "US SELLER, WP-17FV 12ft 150A, Air-Cooled TIG Welding Torch Gas Valve & Flex Head" is in sale since Thursday, March 1, 2018. This item is in the category "Business & Industrial\CNC, Metalworking & Manufacturing\Welding & Soldering Equipment\Welding\Welders, Cutters & Torches\TIG Torches". 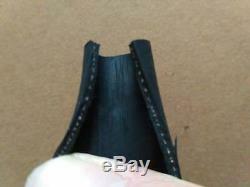 The seller is "cympolliasales2014" and is located in CaliforniaCalifornia.